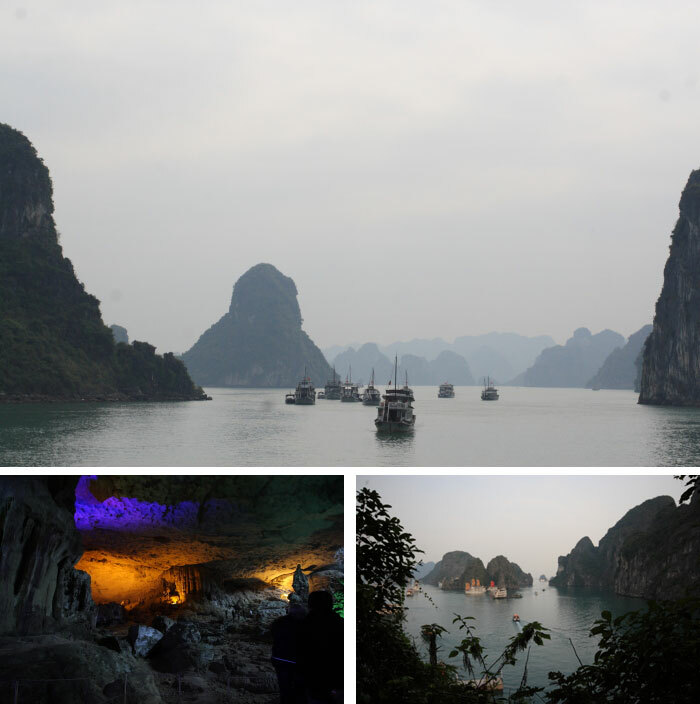 After wandering on the streets of Hanoi on the previous day, the time for us to explore Ha Long Bay finally came. For us, it’s another UNESCO world heritage site in Vietnam to see after Hoi An one year before. 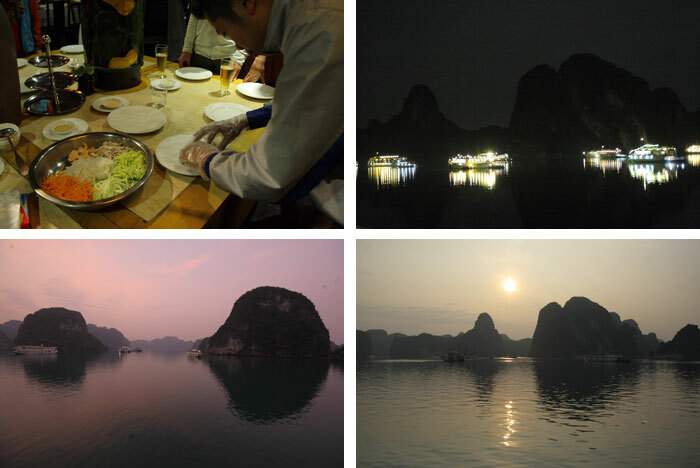 In many blogs we had found before going to Vietnam, the trip from Hanoi to the harbour was said to be 3 to 3,5 hours by shuttle bus. In reality, it was more than four hours. At first, I was excited to see the gradual changes from the hectic urban life of Hanoi to the rural villages where industrial factories were shifted with rice fields through the bus window. At last, I fell asleep. 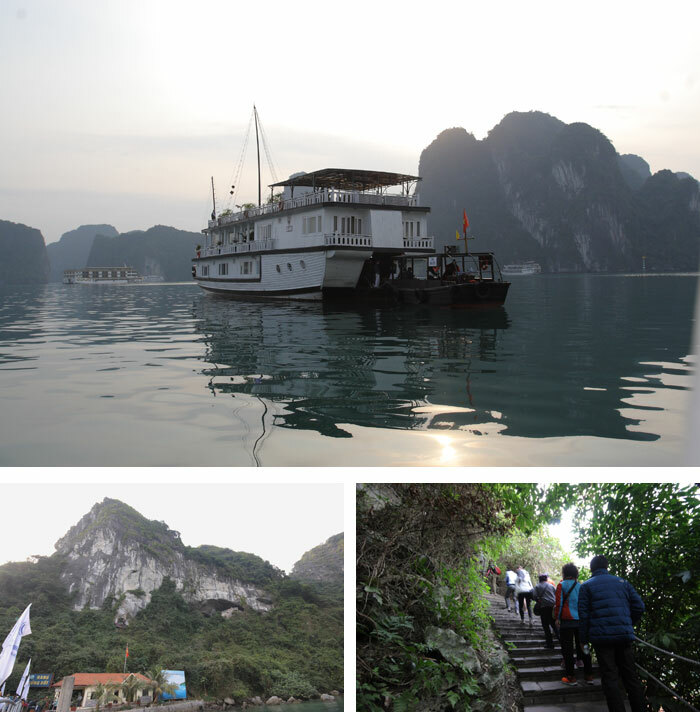 We were brought to Bai Chay harbour, the embarkation point for boat tours of Ha Long Bay. From the harbour, we were brought with a small boat to the the big boat. 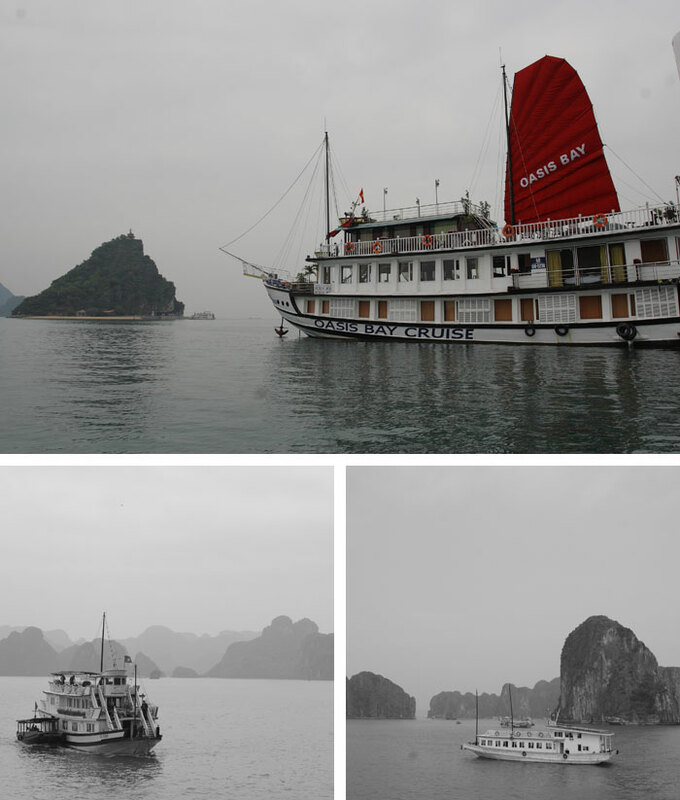 We took a cruise that we had selected from some brochures reccomended by the hotel we stayed in Hanoi. The price was good and we took the two days one night package. After having a formal fancy lunch, we went canoing. 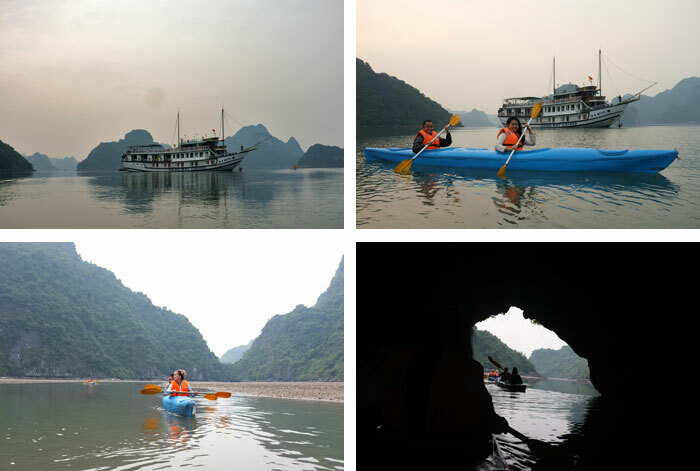 Guided by Pheng, the tour guide, we canoed around the bay, and passed through a small cave. It was amazing. We could see some natural cliffs from close. The nature was very well preserved, no wonder if UNESCO had put it in their world heritage list. In the evening, before we had a fancy dinner, we were introduced to making the traditional Vietnamese spring roll. All the ingredients had been prepared on the table. Since we both are Muslim, they didn’t give us pork on the plate. The following morning, we were transfered to the smaller boat that had taken us from Bai Chay to the big boat in the previous day. That morning, we were brought to a cliff where there was a huge cave inside it. 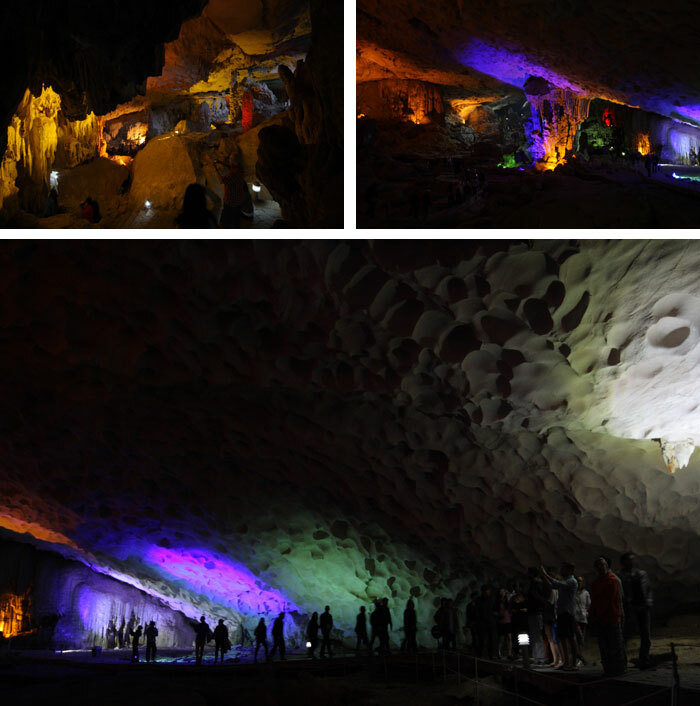 The cage was known as Hang Sung Sot, or the cave of surprise. To reach the cave, tourists had to climb many stairs. Well, I didn’t keep a record of how many steps we had to climb, but it nearly literally took our breaths away. It was true what most people said in their blogs, the cave was amazing. Supported with good lighting, the interior of the cave became attractive. I guess the most enjoyable part of visiting this place was when we got to the viewing deck. From that place, we could see the bay from above. Not the entire bay, but still, it’s amazing. 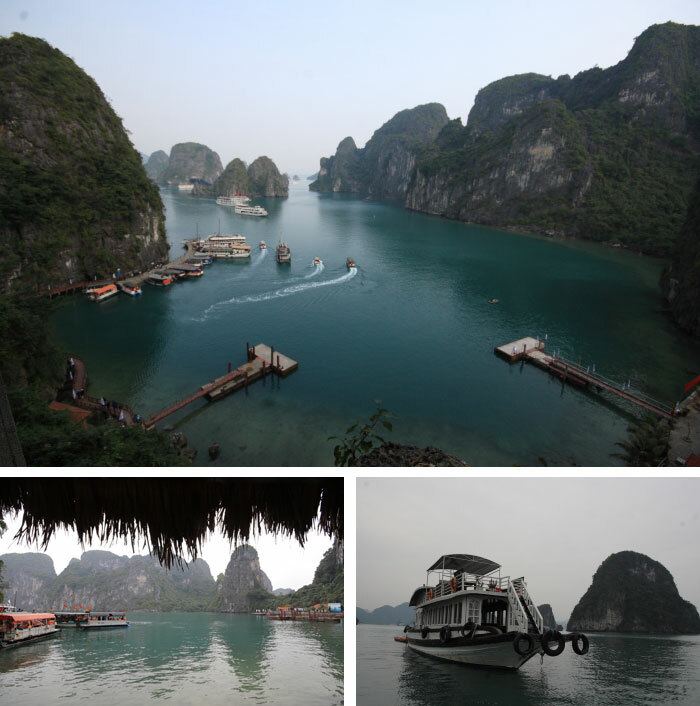 The tour that we took didn’t include visiting the floating fishermen village. Too bad, we hadn’t learned about it when choosing the cruise. So, as we only took two day cruise, we had to return to the boat, to have lunch, and then sailed back to Bai Chay harbour. Along the way back to the harbour, I couldn’t help but taking as much pictures as I could. From Bai Chay, we were picked up with a shuttle bus that would bring us back to Hanoi. And, again, I fell asleep along the road.